Stack the Decks: Architect Ole Scheeren hypothesized that dense urban residential living didn’t have to occur in an isolating skyscraper—and he was right. In 2010, Scheeren left OMA to open his own firm, Buro Ole Scheeren, with offices in Beijing and Hong Kong, and he has continued this large-scale work with a mixed-use tower rising in Kuala Lumpur, another under construction in Singapore, and a cultural center in Beijing. “I think architects always battle an ironic position. Once you have a certain amount of success, you are only associated with that success,” says Scheeren. At a superficial glance, the Interlace—a 1.8 million-square-foot apartment complex with 1,040 units—is another of these projects, the design of which Scheeren completed before he left OMA, that threatens to further pigeonhole the architect. It is a breathtaking one, made up of 31 six-story rectangular blocks that appear woven, and are arranged on top of each other at angles. The flush, white-painted concrete facades are occasionally interrupted by slender horizontal balconies, from which greenery will cascade as it grows. The building snakes around and through its roughly rectangular 20-acre site like a line of toppled dominoes. But this isn’t big for big’s sake. The Interlace is smart architecture, and its intelligence is inextricable from its context. Singapore is crowded with drab residential high-rises—any attempt at “design,” if it was there to begin with, has been whitewashed by a slavish adherence to developers’ strict economic-efficiency ratios. This leads to “self-referential, isolated, vertical extrusions that leave very little sense of community,” says Scheeren. A good example is d’Leedon, Zaha Hadid’s seven 36-story residential towers, still under construction, that show almost no sign of their creator’s outrageous signature. “Singapore is one of the most refined and ruthless markets,” says Scheeren. “If you do not hit certain efficiency targets, you simply cannot build.” This economic pressure has forced architects into a design “straightjacket,” he says. 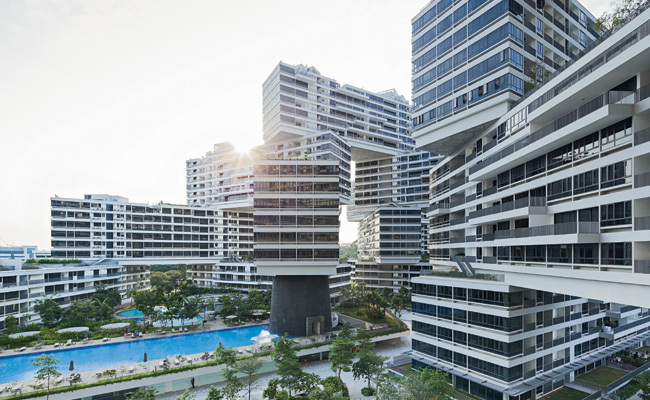 In 2007, CapitaLand, the largest residential developer in Singapore, behind Hadid’s project and many others, commissioned Scheeren to design what became the Interlace. It sits in a lush greenbelt to the west of the downtown core, about two miles from the National University of Singapore and a mile from the ocean. Originally, CapitaLand proposed 12 towers for the site, each 24 stories tall, which would have resulted in about 115 feet of residual space between the towers, “like a mini-Manhattan in the middle of nowhere,” says Scheeren. Instead, he “toppled the towers,” making the vertical horizontal. Taking blocks 230 feet long and 54 feet deep, he arranged them in hexagons and then rotated them 120 degrees. This allowed for around 200 feet of space between the towers and views out—to the tropical forest, ocean, and other buildings nearby—at every turn. The architect varied the concrete buildings’ height—among 6, 12, 18, and 24 stories—by stacking the volumes in different configurations. “It’s still a skyscraper, but it reads entirely differently,” says Scheeren. The points where the volumes overlap—again, hexagons—become the “megacores,” which contain services and circulation. The megacores are made of six columns that help support the blocks. Though the unified form is enormous by any measure, the effect on the ground, or from a balcony, is never oppressive. “It’s both defined and yet totally permeable,” says Scheeren, and he’s right. This is in part achieved by an interconnected series of eight courtyards that knit the structures together, each with a slightly different program. The building volumes shade these spaces, which are meant to inspire community and are filled with greenery and water features. They also serve as the circulation path leading to each core. Though OMA did not design the individual units’ interiors, Scheeren made sure not to sacrifice the spatial quality of the two-, three-, and four-bedroom apartments (and penthouses) for an expressive exterior. The generous units have simple finishes and ample windows, however bland. Scheeren moved to Beijing in 2004 to oversee the design and construction of CCTV, and he lived in Bangkok in the 1990s. He has long had a fascination with building for the tropics, and the tug-of-war between nature and the manmade. With the Interlace, he wanted to make the complex appear to disappear—after a few years, the plantings hanging off of its terraces and roofs, as well as those in the courtyards, should begin to stake their claim on the building. “Here, things are overgrown. There is something quite spectacular in a way about that power of nature,” he says. The architect also conducted solar studies and put many passive systems in place, capitalizing on prevailing northern winds. The permeability of the open-block structure allows breezes to pass through them and over water features, making a recent 85-degree day feel cool. With people still moving in, it is unclear whether the Interlace will be successful in creating the kind of communal society Scheeren envisioned. A couple of cab drivers and some local architects question the complex’s location, away from the central business district and lacking easy access to amenities (some stores and services are planned for the building’s ground level). Private development in Singapore is extremely expensive, and most residents live in public housing (80 percent, according to the Housing & Development Board, or HDB, with 95 percent of them owning their flats). In comparison, the Interlace is among the more affordable. Whether or not it becomes a prototype for high-density living in Singapore or other cities, Scheeren has successfully demonstrated that strict regulations don’t have to dictate a poor quality of life or design. “Just because no one has done it doesn’t mean it’s impossible to think about it differently,” he says.